Most side effects of Vicodin are typically very manageable. The most common may include nausea, drowsiness and constipation. As a short-term pain solution, Vicodin is very effective but care should be taken with long-term use as it can be addictive. Since Vicodin is often provided as a pain medication during the recovery period after surgery or injury, many patients do not find drowsiness to be an issue as they are already resting. To minimize dizziness and feelings of lightheadedness, Vicodin patients should rise and stand slowly when they have been laying down. Eating on a regular basis will typically reduce nausea and vomiting. If any of the above side effects are severe or suddenly worsen, you should contact your health care provider immediately. Some patients experience an allergic reaction to Vicodin. If you are allergic to other narcotics such as codeine or morphine, you may be allergic to Vicodin as well and should tell your doctor. If you experience any of the following side effects while on Vicodin, you may be having an allergic reaction and should seek professional medical attention immediately. If you experience any of the above severe Vicodin side effects, you should consult your doctor immediately. One of the most common Vicodin side effects is constipation. This is true of all opiate narcotics and many doctors will prepare for this by providing a laxative along with the pain medication. Unlike other common side effects, constipation will not ease or go away as the body adjusts to the medication. Taking a stimulant laxative will usually take care of this problem. If you experience severe constipation you should consult your doctor. When taken responsibly, Vicodin can be an effective solution for pain. If you feel the urge to take more than the recommended dose of this medication, you should consult your doctor immediately. 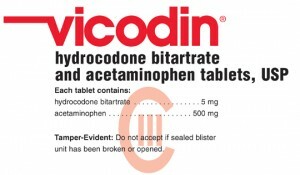 Vicodin is a serious narcotic and should always be taken according to your doctor’s instructions. If you experience unusual or disruptive side effects with Vicodin at any time, seek medical help to avoid long-term complications.